cals, hormones or additives, these healthy dog treats are a natural source of glucosamine and aid in joint pain and mobility. Made only of all-natural Australian chicken, these single-ingredient chews also promote healthy teeth and gums through the provided gnawing action! Ranging 4 to 6 inches in length, these crunchy chicken treats are a perfect chew for small dogs or welcomed snack for larger breeds. 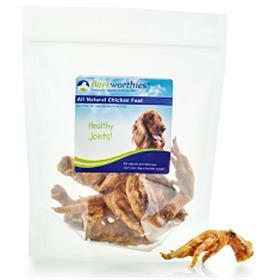 Barkworthies Chicken Feet are a great way to give your pup a wholesome treat without sacrificing flavor. As with all of our products, Barkworthies are additive-free, chemical-free, and preservative-free dog chews. In fact, most Barkworthies products are all-natural, single-ingredient chews, making them healthy and safe for your dog.